But three little reflectors on a short metal post in front of a giant redwood close to a highway we were traveling during October made me think that Oregon got it right on one thing. 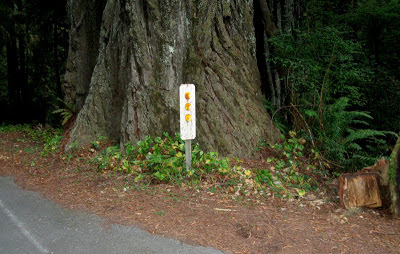 The reflectors are apparently a practical, simple, fiscally responsible way to alert drivers to avoid crashing into that substantial tree occupying the shoulder of the road. We saw a number of those giants close to the edge of the pavement, and the little reflectors announced each one. Although I love the redwoods, I am glad those ancient trees are not along any highways in my state. I base that opinion on the fate of the wide median of a highway I traveled frequently at one time. I was driving at least once a week the 90 miles to my mother’s to visit or to take her to doctors’ appointments. I enjoyed the calming beauty and variety--pine trees interspersed with dogwoods, cypress, red maples, the occasional wild plum tree, pecan trees and other species. Then one day heavy equipment was bulldozing the trees and scraping the median bare. An outcry did save a small grove of live oaks planted many years ago. I still don’t know what the highway department powers that be had against woods and the critters dependent on that vegetation. But the few news reports I saw never mentioned any consideration of simpler, less drastic actions. The trees that added such color and grace to that drive were gone. Arggghhhhh. This is a really great idea! I hope it did not take a lot of wrecks before they finally did this. I agree with Oregon's care of its people and trees. Can't imagine what they were thinking of in your area by bulldozing the median. It always upsets me when trees are cut down. Wish there were more tall trees in my neighborhood. here in Florida they raped the land with bull dozers for years and years.. finally much to late it is now against the law to remove trees without a permit and they don't give out many permits. we have several streets that were built aroudn 150 year old oak trees. they split the roads. It breaks my heart to see a living tree cut down. Necessary is one thing, but when unnecessarily cut down really hurts. Don't they know the benefits of trees? Redwoods are such proud stately trees. I feel like I am in a cathedral when I am there. We have had a huge uproar in our area over trees too. A huge stand of ancient Oaks seems to be the target of land mongers. Right now things are at a standstill and I hope cooler heads will prevail. Sick trees are one thing but clear cutting makes no sense to me. Have a great day Linda. I'm happy to see the sun peaking its nose out from behind the clouds today.